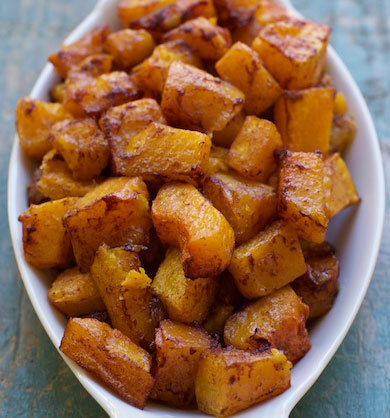 This Roasted Maple Cinnamon Butternut Squash is delicious on it's own or incorporate it into a pasta or salad recipe. It's perfect for a Thanksgiving side too. It's just sweet enough to taste like a guilty pleasure...but it's not guilty at all! 2Pre heat oven to 425 degrees F with the rack in the middle. Prepare a baking sheet with tin foil. This will make clean up way easier! 3In a bowl, whisk together the oil, cinnamon, maple syrup and salt. 4Place the squash on the baking sheet in a single layer. 5Drizzle the maple mixture over the squash. Toss with with clean hands, make sure every piece is well coated. 6Bake for 30 minutes, rotating the pan and tossing the squash with tongs half way through cooking. 7Serve as a side dish or with pasta or over a salad.